Taiwan - which is claimed by China but ruled as an independent country under a pre-communist version of the Chinese constitution - was allowed to stay after the communist government in Beijing took over UN representation of Mainland China in 1979. But a compromise deal made at the time says Taiwan has to call itself "Chinese Taipei" in the games. Disputed Palestine, whose claimed territory is largely controlled by Israel, was admitted in 1995 for the sake of athletes in the Gaza Strip and West Bank, whose residents don't have Israeli citizenship. Palestine has since been recognized as a UN observer state, but at the time it had no UN status. On the other hand, it had already been recognized individually by about 100 of the world's countries (more than half of the UN's members). The third non-UN country in the Olympics, Kosovo, is a more recent addition. A region that controversially declared independence from Serbia in 2008, Kosovo has been blocked from UN membership by objections from Serbia, Russia, and other countries. Still, the IOC decided to admit Kosovo as an Olympic Nation in 2014 after about 55% of UN member countries had recognized Kosovan independence. No entirely new Olympic Nations have been approved by the IOC since the Rio 2016 games, though PyeongChang 2018 will feature one very large national-level "team" that technically didn't participate in previous Olympics. Because Russia has been suspended from the games over an ongoing drug-related cheating scandal, the Russian athletes allowed to individually participate this year can't use the Russian flag or national anthem. Instead, they'll be part of a special group called "Olympic Athletes from Russia (OAR)", which uses the flag and national anthem of the Olympic Games. And there's one more technically-new team participating in this month's Olympics: Korea. As a gesture of peace, North Korea and South Korea will be walking in the Parade of Nations under the Korean Unification Flag. They've done that before, at the 2000, 2004, and 2006 Olympics - but this year, for the first time ever, they'll also compete together as a single team in one sport: ice hockey. In other sports, they'll be competing separately as usual. Why would the two Koreas want to make a gesture of unification? Because each country considers itself the rightful government of all Korea, and they agree on the basic principle that the Korean Peninsula should eventually be unified. Learn More: What is North Korea, and how did it become divided from the South? At the Rio 2016 games, there were two new Olympic Nations: Kosovo, the disputed breakaway state mentioned above, and South Sudan, which became independent and joined the UN in 2011, then was approved as an Olympic Nation in 2015. 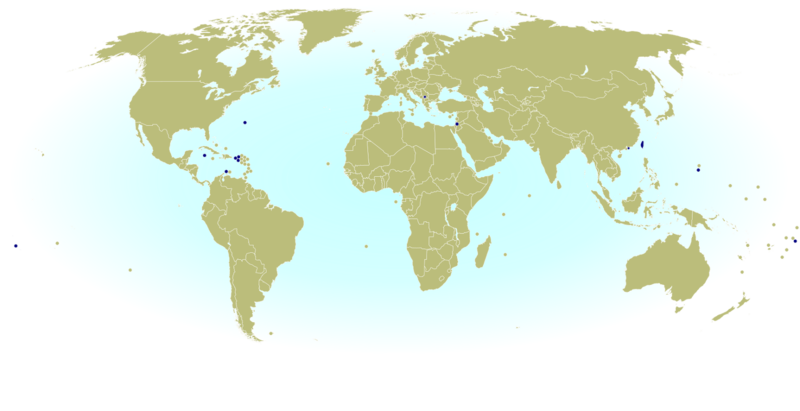 Before that, the last Olympics to have new countries were the 2008 Summer Games in Beijing, where the Marshall Islands, Montenegro, and Tuvalu were added to the list. Which countries aren't in the Olympics at all? 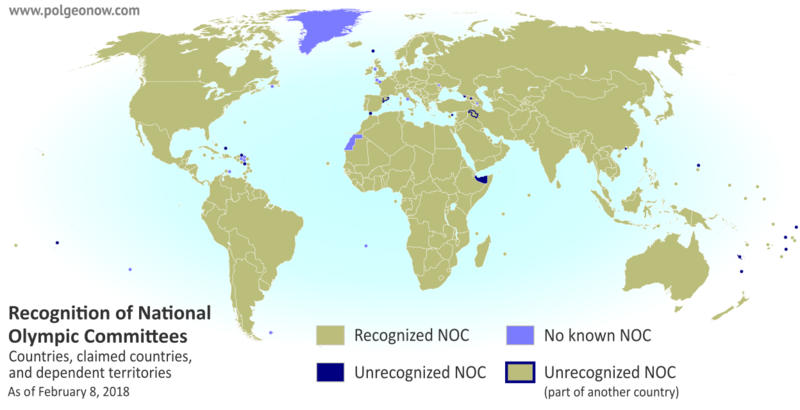 There's only one UN-recognized independent country not represented in the Olympics: Vatican City, the independent Catholic Church headquarters in Rome, has never applied. Still, despite the inclusive and worldwide mission of the Olympic Games, not all applicants have been allowed in. Click to enlarge: Territories and self-proclaimed countries not allowed to send teams to the Olympics. How many countries are attending the PyeongChang 2018 Olympic Games? Being an Olympic Nation doesn't mean you have to actually send athletes to every Olympics. And unlike the Summer Games, which sometimes feature every single recognized Olympic nation, it's normal for a lot of countries to skip the Winter Olympics. Not surprisingly, most of the absentees are tropical countries where there are few chances to practice winter sports - though there are always a few exceptions. This year there are 91 nations participating in the games - a record high for the Winter Olympics, beating out the previous record of 89 nations from Sochi 2014. Adding in the special "Olympic Athletes from Russia" group and the joint Korea team (both discussed above under "Which countries are new? "), that leaves a total of 93 different flags athletes will compete under at PyeongChang 2018. Wikipedia has a full list of the participating teams, complete with links to the athlete rosters for each country. About 20 of the teams are from tropical countries and territories, while the only real cold northern country missing is Russia, due to the ban on its official national team. Still, there are a few countries with snowy mountain ranges - like Nepal, Peru, Afghanistan, and Tajikistan - that are also sitting it out this winter. Because the separate North Korea and South Korea teams are marching together under "Korea", there will only be 91 delegations in the Parade of Nations (though North and South Korea will still compete under their separate flags for most sports). There's a complete, ordered list of the 2018 Parade of Nations countries and flagbearers at Wikipedia. Are you watching the Parade of Nations? Tweet to us @PolGeoNow with your thoughts or questions! The five associations are based closely on the world's continents, but with a few quirks: The southern Caucasus, Israel, and eastern Turkey are part of the European association despite traditionally being considered part of Asia; and the South American territory of French Guiana also falls under European jurisdiction, because it's considered part of France and doesn't have a separate team. "Chinese Taipei" is intended to be ambiguous, since most Taiwanese people consider themselves to be at least culturally Chinese. However, the use of "Taipei" is unfortunate for the two-thirds of Taiwan's people who don't live in or near the city of Taipei. This was especially awkward when the 2009 World Games (an Olympics-affiliated event) were held in Kaohsiung, Taiwan - something of a rival city to Taipei.